Beaujolais Nouveau meets the Austrian red grape Zweigelt in a juicy ball of light red fruit fun. Good work Larry & Hahndorf crew, I like. Light red, the colour doing a good cherry juice impersonation. Plenty of carbonic roundness here to start, before a tart, refreshing finish keeps things in check. Smashable. 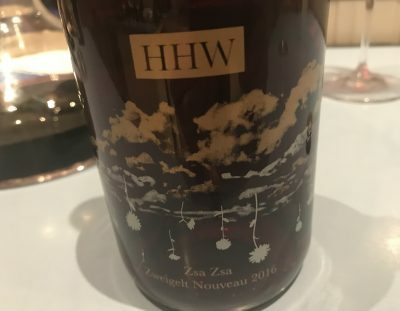 Much more interesting than your average Nouveau (which is basically just Duboeuf in Oz), the cherry fruit lively and complete with a late tannin bite. A step away from rosé, but a good one, even if it’s a simple drink (and scored accordingly). Drink young and enjoy the vibrant fruit. Best drinking: 2017-2018. 17/20, 90/100. 11.5%, $33. Would I buy it? I’d drink a bottle of this in a heartbeat.